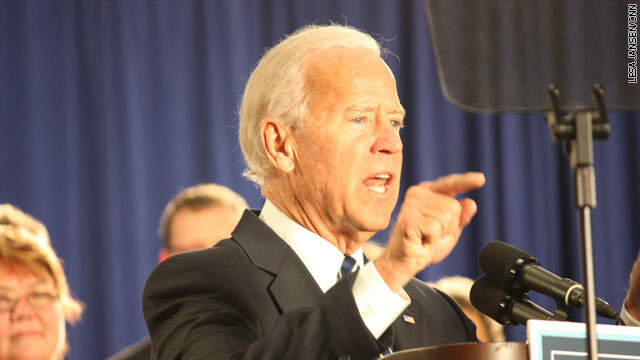 Danville, Kentucky (CNN) – Senior Democrats are predicting a scrappy competitive debate between Vice President Joe Biden and Rep. Paul Ryan when they meet onstage in Kentucky Thursday. But both men are collegial people so don't expect a fight club atmosphere. He's been working out of the same hotel in Wilmington, Delaware that housed his 2008 prep. Each day since Sunday he held a full 90 minute mock debate plus additional work sessions, all run by debate expert and former Biden chief of staff Ron Klain. The vice president's current chief of staff, Bruce Reed, was also present. Give em heck JOE, your the best VP ever. Long live Joe Biden a true and honest man. You're obviously a paid troll and not a very good one at that. Biden is an honest man??? Are you kidding ??? The biased, partisan, main stream media has consistently promoted and sold Obama to the American public ... while trashing and demonizing his opponents. Along with the brain washed Obama zombies, they have catapulted Obama into the role of 'Fuhrer' ... and of 'Dear Leader'. The Obama Stooges love Obama more than they love America. Obama is destroying America. America is more important than Obama. Obama is expendable and replaceable ... America is not. Save America ... Elect Romney and Ryan in November !!! Go Joe Go! Great job in peeling back the onion of deceit being put out there by R&R. I will have to say that no matter what political party you are thinking of voting for... Mr. Biden has been a complete embarassment to our country tonight! I fell he was very rude with the laughs and the rolling of the eyes. Him and Obama has had 4 years to change things, I don't see any changes except his healthcare. Best VP ever? Other than delusion and partisanship, what do you base this statement on? WHo knew he really is "crazy Joe"? I remember in 2008 when Candidate Obama won the election. There were a serious number of posts claiming he was our best president ever. The only problem is that he was not yet the president. The best is something you would need to earn. I was once told by my mother who voted against Harry Truman that if Truman ever said anything, you could believe it. He was honest as president and vice president. Sorry, I just don't believe VP Biden compares. Crazy Joe, Statesmen Joe...I like'em both. He is a great VP. There's two Joe's ... you know ... JOJO ... you wind him up, and he makes lots of meaningless, obnoxious noise, banging his little cymbals together. California left out of the unemployment numbers. Obama playing the Big Bird card? The desperation in the Obama administration is astounding and quite pathetic at the same time. I can just hear Joe now.. "I knew Theodore Roosevelt , and you son are no Theodore Roosevelt" . You might see a combative Biden, but not a competitive one. Joe cannot resist letting his alligator mouth overrun his hummingbird tail. It was cringe-inducing to watch Joe gloat during the convention about 'GM is alive and Bin Laden is dead'. The truth is that Ol' Joe was opposed to the operation (he was against it before he was for it). Now we see the Chevy Volt battery plant closing and thousands of little Bin Laden wannabe's running around the Middle East with RPGs on their shoulders. Anyone remember the real Joe Biden – the guy who plagiarized a speech and was forced to drop out of a presidential campaign and shouted out that ObamaCare was an effing big deal? The guy is a big-mouthed dimwit. He was a lousy senator who put in half-time weeks so he could go home to Delaware for three and four day weekends – every week for thirty-six years. The very same State Department that turned down an Embassy budget request for security in Lybia. Spent $108,000 for Chevy Volt charging stations in Vienna and $45,000 for a single Chevy Volt in Oslo and then promoted it as part of their "Green Energy" program. Not that CNN has shown any interest in the security of our Embassys and their staff..
ALSO: Obama made policy that NO U.S. SERVICEMAN CAN SPEAK AT A FAITH-BASED PUBLIC EVENTS ANYMORE. your mistaken if you really believe obama is an America..he is no more an American than he is a Christian. No American brain and a hatred for Americans and all that is good. I totally disagree with the majority of Obama's policies, but he is as American as any of us. He and his lib friends have a very different point of view than me, but that doesn't make them "unAmerican". @Howard Pinnochio who never checks his viral email based posts with Fact Check, or any other source... as usual your post is another lie. Change in Military Funeral Protocol? Q: Did Obama order the military to drop the words “on behalf of the president of the United States” when presenting the flag to the next of kin at funerals? A: A chain email that makes that claim is wrong. Spokespersons for the Defense Department and the armed forces say that no change was ordered. So, since Obama laid an egg, and showed what a hollow, empty fraud he is, now the press is trying to make this debate bigger than what it is! Funny how most of the media is giving Biden advice.....Someone please give Chris Mathews some pills or something. The man is going to have a meltdown! Biden stopped being anything of value years ago. He has been in DC since 1973 and is PART OF THE PROBLEM he needs to go...and on top of that he is an idiot! Joe Biden is down to earth and honest....Ryan is a slick weasel that can't even be pinned down to give an honest answer. "slick weasel" sounds like hate speech. Name calling is all Social Liberals have left. Well Jean, my father who watched the entire debate would disagree. Especially the part where the Vice President looked into the camera claiming medical costs did not rise for seniors during the past 3 years. At least for some, they have. I guess you will have to decide for yourself who you want to believe. I personally thought this "down to earth" Biden was simply rude while Ryan listened intently. @ Caramon-As a senior, then I will tell you your father is not being factual as my costs have gone down over the last four years by a considerable amount. I'm also one of those persons who over the last 4 years has experenced more of any medical .system than people ever wish to..During that period of 4 years I lost a husband of 58 years to cancer...which included rounds of chemo & radiation, hospital stays, nursing home stays, and hospice care. I can look at an office binder full of medicare & seondary insurance statements and I'm very grateful for both being available, and for making my burden less. So, I can personally tell you for the person who is not independently a millionnaire... it financially can't be done without Medicare.That Medicare is essential, and the cost is reasonable, and it should never be converted to a state run voucher system..
Biden's behavior tonight is an embarassment to our Country! What is he?... 5 years old? Thought you would say that.... just a buch of kides on a play ground poking fun at anyone they can.... Just like you do! and other places ended no one want to be back home(american)because of self fish interest. Biden looked like a cranky old geezer. 2 against one and Ryan still came out on top. And that is different how? Joe Biden is an idiot. He displayed it one more time. He was rude, condescending, and smug. He disrepected the debate, his opponent and the moderator like has never been done before since the televised debates began with Kennedy and Nixon. Al Gore shorely coached screw-up Joe on last nights performance. Way to go democrats !! Not to mention the O-Media team. Lyin' Ryan looked like a slick used car salesman trying to sell the same failed policies of the past. He couldn't be pinned down or give logical answers to any of the questions asked. s for this debate. biden has been in DC since 1973...the same old tax the producers, grow govt and etc...and look at europe. He is a tired old baby kissing back slapping goof ball... Ryan certainly showed class and respect while biden interrupted, cussed, and generally make a fool of himself. Cant believe biden even threw one into our Intell agencies and still blaming President Bush...a real class act...whew! Time for a change...keep doing the same stuff get the same results...that is obama/biden in spades. Nov 6, 2012 is only 3 weeks away. Americans get off your butts and go VOTE. The word is condecsending ... not competitive... wow this is what liberals are.... look at them in this thread and others you can see the same arrogant condecsention from the president to the veep to all liberals... laugh away there Joey... you might get a surprise.